An economy is usually made up of three distinct, yet overlapping, sectors: the public sector including all levels of government, the private sector and the civil society. In the broadest sense, public sector creates a favorable political, legal and economic environment; the private sector creates economic opportunities; and the civil society ensures mobilizing peoples’ participations. 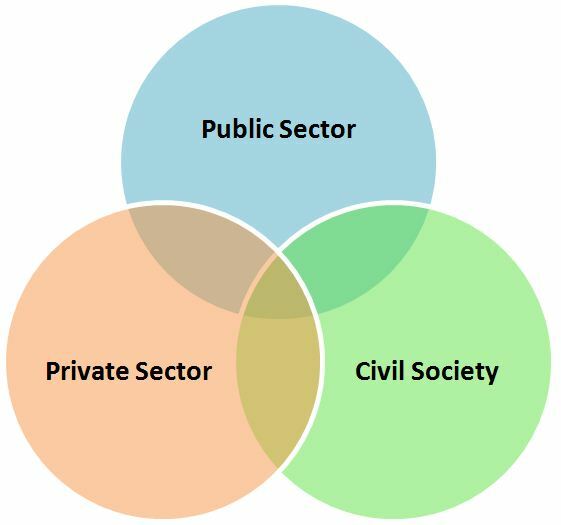 Speaking of the third sector, the civil society, alternatively called the voluntary sector, is an aggregate of non-governmental organizations (NGOs), non-profit organizations (NPOs), charities, foundations, activist groups, academia, professional associations, trade unions and so on. Although, all of these are collectively labelled as the civil society; in reality the third sector organizations have been traditionally functioning as disparate entities, operating in isolated siloes with little or no interface with each other. Perhaps, the only common characteristic- all of them operate in the space between the public and the private sector. Of late, a new and interesting paradigm of identifying, organizing and managing the third sector of the economy has come to the fore- called as “social economy”. As a result the civil society has been increasingly referred to as the social economy. However, important to realize, the concept of social economy is something way above and beyond a mere change of nomenclature. It involves a 360 degree integration, transformation and reorganization of the civil society, before it could be truly rechristened as social economy. Social economy is the entire segment of the economy that is composed of third sector entities, seamlessly integrated and working as an unified whole to increase social inclusion and reduce inequalities, while simultaneously creating economic value. Coming to the crucial question, how does the third sector transform into a social economy? There is no single answer. Governments around the world are making incremental contributions tailored as per their specific social, economic and political environments to transform their third sectors into social economies. Some of these contributions include changes to the regulatory frameworks within which social economy organizations operate including: beginning with classifying them according to development themes like livelihood, heath, education and so one; standardization of the services provided by each of them under the respective themes; introduction of a range of funding approaches supporting the delivery of such defined services; creating investment funds; and expanding the range of organizations that can provide public services. Moreover, social economy organizations like social enterprises and co-operatives provide a model of enterprise that explicitly blends social with economic aims. The success and growth of these models within the market is contagious and in the long run will have humanizing effects on the operations of the market as a whole. This at least is the hope. In fact, the adoption of corporate social responsibility practices by firms and the recent trend toward sustainable development are possible examples of this effect. Hence, the social economy framework has often been argued as a means to proposing an alternative to the limits and inequalities of a market-driven economy. Placed in this context, the social economy, rather than operating in siloed spaces between the public and private sector, in fact, can essentially augment and supplement both the public and the private sectors. It has all the potential of contributing to employment, social inclusion, provision of public services, facilitating democratic participation and community building. However, much remains to be done so as move beyond the “civil society” and into the social economy– to create the necessary enabling environment and an overarching framework to support the evolution and development of social economy organisations and to mainstream the sector in economic and social policies in order to maximise its impact on the economy.